There are many objects throughout a household that children can swallow, but one particular object that has warranted many calls to the Regional Poison Control Center at Children’s of Alabama (RPCC) are disc batteries, which can easily be mistaken for a quarter or other coins. The RPCC at Children’s of Alabama has received 60 exposure calls related to disc batteries in the last three years with no fatalities. Disc batteries are round flat batteries that range in size from a pencil eraser to a quarter (5 mm – 20 mm) that are used in watches, calculators and hearing aids. The majority of exposures to disc batteries occur in curious children. 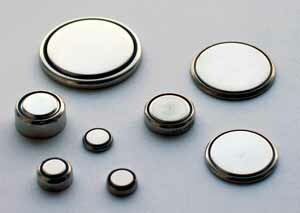 From 1985-2009, 56,535 disc battery ingestions were reported to the National Poison Data System. Fortunately, deaths after swallowing a disc battery are rare, less than 0.02 percent. However, these ingestions are serious, so it is important to be aware of the symptoms of possible poisoning. These symptoms include cough, wheezing, irritability, poor appetite, vomiting, lethargy, fever and dehydration. More often than not, the caregiver did not see the ingestion of the disc battery, but if a disc battery is swallowed, an X-ray is needed to find its location in the body. Only then can appropriate recommendations be made. If the battery has moved beyond the esophagus, most will pass uneventfully through the rest of the digestive system and pass within a matter of few days. If the battery is lodged in the esophagus, it is considered an emergency and requires immediate removal. A disc battery becoming lodged beyond the esophagus is unlikely, but if it happens, burns may occur resulting in tissue damage and internal bleeding, causing in a medical emergency. The majority of disc battery ingestions occur immediately after the battery is removed from the object, but discarded or loose batteries also account for a fair amount of ingestions. It is very important to keep disc batteries out of reach and out of sight! National Poison Prevention Week is March 16 – 22, 2014. The themes are “Children Act Fast…So Do poisons!” and “Poisoning Spans a Lifetime.” While pediatric (less than 6 years of age) exposures account for 52 percent of The Regional Poison Control Centers (RPCC) at Children’s of Alabama human exposures; adults also experience poisoning with adult exposures accounting for 32 percent of the call volume. The RPCC received 37,842 calls in 2013 including more than 24, 000 human exposures with more than 44,000 follow up calls. In 2014 the RPCC expects to receive 58,000 calls with 38,000 human exposures. The RPCC is available 24/7 at 1-800-222-1222.